BEND, OR, November 06, 2018 /24-7PressRelease/ — Ventana Research today announced the 10 winners of the 2018 Digital Innovation Awards. These awards, presented annually, identify the technologies that have the most striking impact in their respective markets. 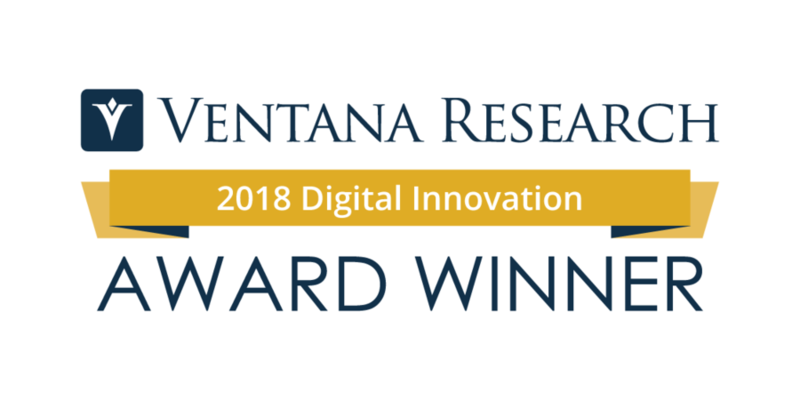 The prestigious Ventana Research Digital Innovation Awards recognize pioneering vendors that contribute advancements in technology, drive change, and increase value for organizations worldwide, backed by market research and analyst expertise across business and IT. The annual Digital Innovation Awards are delivered by the Ventana Research team, which through its benchmark research, on-demand advisory and education continues to pioneer new methods for organizations to become efficient and effective in their business. As part of the scoring process and methodology, Ventana Research examines the submissions for not just the innovative technology approach, but also how it applies to people, processes, information and technology, the best practices it supports, the degree of team involvement and the technologies, business impact, and value. Ventana Research invited all technology vendors to participate by nominating their innovations to be considered for the awards. Award winners were selected based on their technology and the extent to which they help organizations innovate or enhance the productivity and outcomes of their business or IT processes. These Digital Innovation Awards span across the 9 areas of expertise at Ventana Research, with one overall Digital Innovation Award winner. The 2018 Overall Digital Innovation Award Winner – This award is the most prestigious award offered. It is given to a vendor who best exemplifies Overall Innovation and change. Analytics – This award is for the technology vendor that best exemplifies innovation in any use or application of analytics across business and/or IT. Big Data – This award is for a technology vendor that best exemplifies innovation in big data and related technologies for supporting data and information management related needs. Customer Excellence – This award is for a technology vendor that best exemplifies innovation in applications and technologies that support the engagement with customers for any purpose. Digital Innovation – This award for a technology vendor that best exemplifies innovation in the technologies that support any or all of the following areas: Big Data, Business Analytics, Business Collaboration, Cloud Computing, Internet of Things, Machine Learning, Mobile Technology, Social Media or Wearable Computing. Human Capital Management – This award is for a technology vendor that best exemplifies innovation in the applications and technologies that support human capital management. applications and technologies that support marketing. Office of Finance – This award Is for a technology vendor that best exemplifies innovation in the applications and technologies that support the office of finance. Operations and Supply Chain – This award is for a technology vendor that best exemplifies innovation in the technologies that support the operations or service/supply chain. Sales – This award is for a technology vendor that best exemplifies innovation in the application or technologies that support the sales organization. Ventana Research highlights and acknowledges the importance of these innovations through the annual Digital Innovation Awards. To learn more about the Ventana Research Digital Innovation Awards and to see what previous award recipients have said about them please visit: www.ventanaresearch.com/Awards.